3과 우문 안의 개구리가 될 거예요. 나... 저도 뉴스를 보려던 참이었어요. 가... 그런데 텔레비전 뉴스는 말이 너무 빨라서 알아듣기 어렵지요? 나... 그렇다고 그것마저 안 들으면 우물 안의 개구리가 될 거예요. 가... 지금 저 아나운서가 뭐라고 그래요? 나... 내년에도 세계 정치와 경제가 불안할 거래요. 가... 지금 이 순간에도 각국에는 끊임없이 전쟁과 사건이 일어나고 있겠지요? 나... 그럴 거예요. 요새는 끔찍한 사건이 하도 많이 일어나서 뉴스 보기가 무서울 정도에요. 가... 그렇게만 생각하지 마세요. 세상은 생각하기에 따라서 비관적일 수도 있지만 낙관적일 수도 있어요. 살인, 유괴 같은 좋지 않은 뉴스도 많지만 착한 사람들의 이야기도 많으니까요. 우물 안의 개구리가 되지 않도록 많은 경험을 하고 싶어요. I want to gain many experiences in order to not become a frog in a well. 우리 아들은 학교 공부밖에 몰라서 우물 안의 개구리가 될까 봐 걱정이에요. We are worrying that our son will become a frog in a well since he just know studying in school. 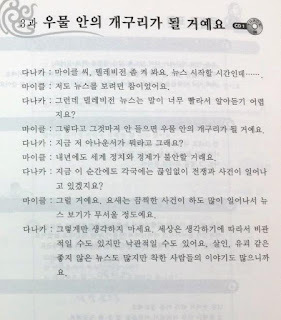 세계 각국 사람들을 만나 보니 내가 그동안 우물 안의 개구리처럼 산 것 같아요. Since meeting people from various countries, it seems I was living like a frog in a well during that time. 그렇지 않아도 내가 너에게 전화를 하려던 참이었어. Anway, I was just about to call you. 나가려던 참인데 마침 친구가 왔어요. When I was about to leave, my friend came just in time. 나도 그 말을 하려던 참이야. 오늘 떠나는 마지막 비행기마저 놓쳤으니 어쩌지요? Even the last flight today was also missed, what should I do? 아버지가 돌아가시고 어머니마저 병들어 누워 계신다고 들었어요. I heard that after his father passed away, his mother even fell sick/became ill.
월급을 다 쓰고 예금해 놓은 것마저 다 써 버렸으니 큰일이군요. Since I spent all salary and even spent my savings, I am in a big trouble. 너무 웃어서 배가 아플 정도예요. Since I laughed too much, it was enough to make my stomach sick. 그 문제는 너무 어려워서 어른들도 잘 못 풀 정도래요. The problem was so hard that it couldn’t be solved by adults. 비가 하도 많이 와서 앞이 안 보일 정도예요. The rain was so heavy that I couldn’t be able to see the front. 오늘 잠을 잘 정도로 피곤하네요. Today I was so tired (to an extent) that I couldn’t sleep. 아나운서의 말은 알아듣기 힘들 정도로 빨라요. The announcer’s speaking is so fast (to an extent) that difficult to recognize. 이제는 한국 사람과 농담을 할 정도로 한국말을 잘해요. Now I speak Korean well as if I can make joke with Korean people. 코끼리를 먹을 수 있을 정도로 너무 배고파요. I was so hungry as if I can eat an elephant. 그 문제는 생각하기에 따라 쉬울 수도 있고 어려울 수도 있어요. That problem, as what I thought, can be easy or can be difficult. 생각하기에 따라서 즐거울 수도 있고 괴로울 수도 있겠지요. As what I thought, it can be sad or enjoyable. 돈은 좋은 것일 수도 있지만 생각하기에 따라서 나쁜 것일 수도 있어요. Money can be a good thing, but in a certain sense, can be a bad thing. 그 그림은 보기에 따라 어린아이가 그린 기림 같기도 해요. As what I have seen, that picture seems to be drawn by a child. 말이란 듣기에 따라서 오해를 할 수도 있어요. As what I have heard, it can be a misunderstanding. B… I was also about to watch the news. A… But speaking in TV news is very fast, is it difficult to listen? B… Even it is (difficult), if I don’t listen, I will be like a frog in a well. A… What that announcer is talking about now? B… The world politics and economy will be uneasy in next year too. A… Now in this moment each country is happening endless affair and war, right? B… It’s probably like that. These days horrible incidents are happening so many that watching news would be enough to scare me. A… Don’t just think like that. This society, as what I thought, can be pessimistic, but can also be positive. Because stories of good people are also many, although bad news like murder and kidnapping are many.